The Sinfonia piccola, op. 66, for 8 double basses was written on the occasion of the international double bass seminar on the Isle of Man in 1978. It is an attempt to exploit this instrument for symphonic gestures and procedures. In 4 movements, different manners of playing are presented and linked to contrasting procedures in form. Pathos as well as a scurrilous touch set the tone for this symphony "en miniature". 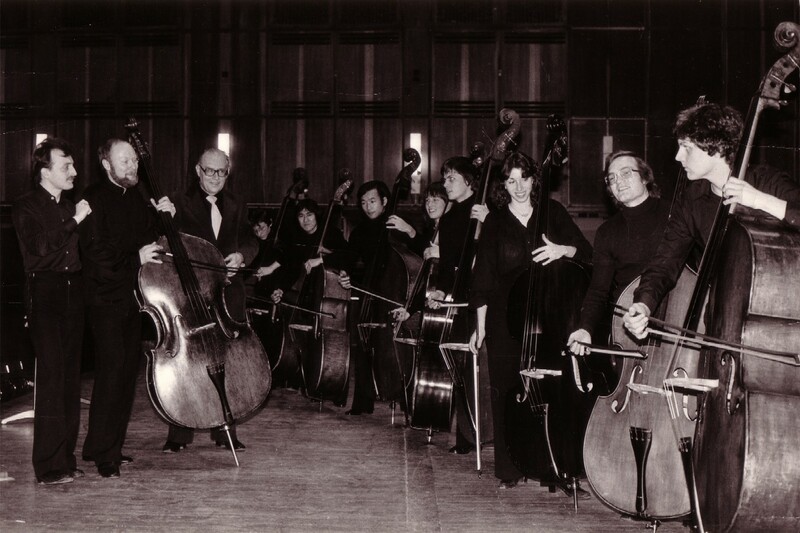 Bertold Hummel composed the Sinfonia piccola in 1978 for the first international competition and seminar for the double bass on the Isle of Man (British Isles) where the work was premiered by double bass class students of Günter Klaus from the Hochschule für Musik Würzburg under the direction of Claus Kühnl. Bertold Hummel wrote the following on his composition: “The attempt is made to utilise the instruments to produce symphonic gestures and developments. During the four movements, a variety of playing techniques are displayed and allocated to contrasting formal developments. The wide range of tonal colours includes harmonics, glissandi, pizzicato, tapping on the fingerboard and body of the instrument, solo passages and ensemble playing. The palette of the musical content ranges from a lyrical style to jazz and the fundamental character of this symphony en miniature is determined by both pathos and scurrility”. I had access to the original material for the first performance in the preparation of the current edition. Discrepancies between the score and the parts have been eliminated and several practical performing details added. The technical performing instructions have been provided in two languages. The work is conceived as a double quartet and the following seating position has proved to have been successful in performance: the ensemble should form as wide an open semi-circle as possible: Cb 4, Cb 3, Cb 2, Cb 1, Cb 5, Cb 6, Cb 7, Cb 8. The double basses 4 and 8 require the low C string. The ensemble can make an independent decision as to whether a conductor is necessary for performance; the work can be performed either with or without a conductor. 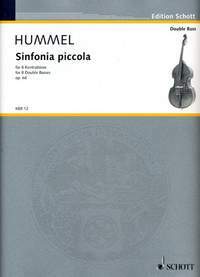 Bertold Hummel has provided a foundation for double bass ensemble literature with his Sinfonia piccola. This edition should inspire double bass players at music colleges and in orchestras to come together and perform on stage in ensemble. The presentation and performance of the current edition will take place in November 2008 at the International Double Bass Festival BASS´ 2008 at the Conservatoire National Superior in Paris and at the 2nd HARMOS Festival at the College of Music and the Performing Arts ESMAE/IPP in Porto. The American premiere will follow in June 2009 at the World Congress of the International Society of Bassists ISB at the Penn State University in Pennsylvania, USA. In the final piece of the evening, the "Sinfonia Piccola" by Bertold Hummel, the Würzburger Kontrabaß-Ensemble could once again pull out all the stops: harmonics, glissandi, plucking, knocking on the finger-board and on the instrument body, solo play and ensemble. During the piece, which used a palette stretching from lyrical to jazzy, one occasionally forgot that only double basses were playing, believing rather that one was sitting in front of a full, well-sounding string orchestra.